This past weekend at my house was… let’s just say interesting. We’ll leave it at that for now… But I woke up on Saturday morning and was hungry. Mark asked if wanted his sausage/tatortot thing and I told him I was thinking either waffles, pancakes, or biscuits and gravy. He chose Biscuits and Gravy. 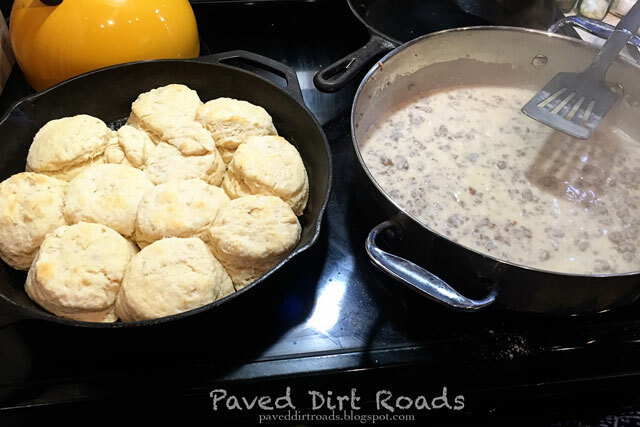 So I hopped out of bed and went and made biscuits and gravy… all from scratch. A few years ago I set out to figure out how to make biscuits. I burned more batches than I care to share, until I found these. 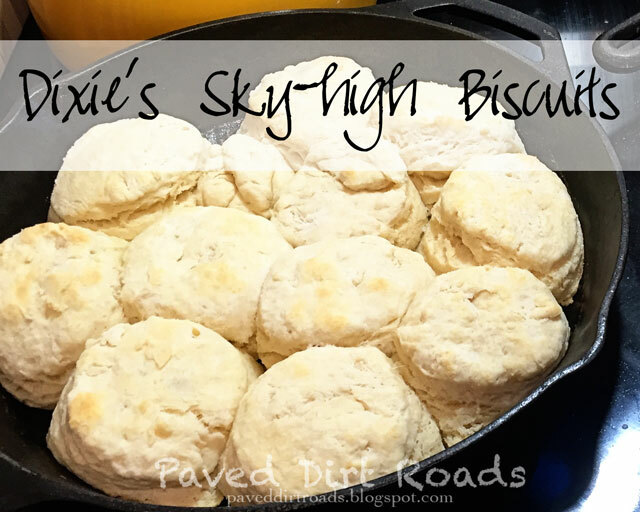 They are big, buttery, thick, flakey, everything you could want in a biscuit. While I was on my quest, a blog friend suggested to melt butter in a cast iron skillet and bake the biscuits in the melted butter in a warm cast iron skillet to get a nice crusty, buttery bottom, and since then my life has been forever changed. If you want a biscuit that is life changing, try these. And if you don’t, well, still try them anyway. Sunday morning I made biscuits again because they are so quick and easy to whip up and we ate them with jelly because I didn’t have any sausage left over for gravy again. Place a cast iron skillet on the stove on low with 2 tbsp butter to allow butter to melt and coat the bottom of the skillet. Combine flour, baking powder, cream of tartar, sugar, and salt in a bowl. Add egg and milk, stirring quickly until just mixed. On a lightly floured board, knead the biscuit dough briefly, 10 or so times. Pat or roll out to about a 1-inch thickness. With a biscuit cutter, cut biscuits and place in the melted butter cast iron skillet. Bake at 400˚F for 12-15 minutes until biscuits are cooked thoroughly and lightly golden on top. Then they are ready to eat with your topping of choice, i.e. gravy, jelly, butter, or even plain!